Our most popular, low-cost doors. Sophisticated styles at great prices. Create a unique style for your room. CLICK A DOOR TO VIEW THE COLLECTION! All Horizon custom made cabinet doors and drawer fronts are produced in the U.S. from lumber sourced in North America (U.S. and Canada). Our products are made-to-order by skilled, experienced craftsmen and shipped directly to you. We keep prices low by eliminating the middleman, not by skimping on quality! Our doors are available either unfinished or, for our most popular wood cabinet species, finished with a stain and clear topcoat or a stain-plus-glaze and a durable, clear topcoat. If ordered unfinished, the products are pre-sanded, ready for finishing by you. Each cabinet door and drawer front is custom sized to your specifications. Pre-boring for concealed hinges is also available. Choices exist for flat or raised panel doors. Flat panels can be either veneered plywood or solid wood. Solid wood flat panels can be grooved for a beadboard look. Raised panels are solid wood or, for paint-grade doors, can be MDF. Doors can be constructed using either mitered or cope-and-stick (also known as mortise-and-tenon) joints. All our door frames are 3/4" thick. The warranty applies to the repair or replacement of the defective product and does not include expenses incurred in the finishing, removal, shipment or installation of the product. It does not apply in the case of normal wear, misuse, abuse, improper finishing, improper storage*, and improper installation. *Doors and other wood products must not be exposed to excessively dry, hot, or humid conditions. Extreme moisture changes can occur in less than 24 hours causing wood to warp, twist, or crack. Twist or warp of 3/16" or less is not considered a defect. Door and drawer front sizes have a tolerance of +/- 1/16". All 5-piece doors over 26" wide must have a center mullion. All 5-piece doors over 48" high must have a center rail. Solid wood slab doors are not warrantied against warp or twist. Cabinet doors, drawer fronts or other products shipping outside the continental U.S. will not be covered by this warranty unless explicitly stated in writing at the time the order is placed. Repair or replacement of any warranty item is at the sole discretion of Horizon Cabinet Door Co. Our liability is limited to the net invoice price for the items sold by us. 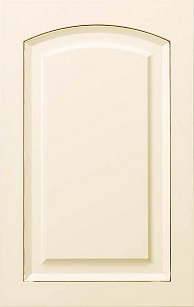 Horizon Cabinet Door Co. continually strives to improve and revise its product offering. We reserve the right to make changes in materials and specifications without prior notification. Material and specification changes are not valid reasons for product refusal or replacements under warranty claims. There are no other warranties of any kind, expressed or implied. Wood will expand and contract as it adapts to the surrounding environment. Mitered doors are more susceptible to joint separation than cope and stick doors. We use a fingerjoint and dowel system to join our mitered corners which produces one of the strongest mitered joints in the industry, yet some separation can occur. A 0.010" gap on the inside corners of mitered doors is not considered a defect. Controlling humidity is especially important with mitered doors. A painted finish is not recommended on mitered doors due to the probability of some opening of the joints. Wood will naturally respond to changes in humidity and the expansion and contraction can be dramatic. A 20" door, depending on the type of wood, can shrink or expand in a range of 1/2" to 3/4" or more when changing between cold, dry conditions to warm, humid conditions. This potential movement makes it very important to control the humidity levels in the environment where the doors will be stored or used. We have developed different grades of material to utilize our natural resources to the fullest. These distinct material grades have been established, allowing you to choose the best alternative for a particular job or finish. Premium Grade is for those jobs where a more uniform look is required. There will be less of the natural material characteristics and the doors and drawer fronts will be produced within a more uniform color range. Orders of Premium Grade products will be matched to obtain a look that is as uniform as possible. However, since each board is different, there may be slight differences in appearance and color between pieces. These products will contain fewer and smaller mineral streaks and pin knots than Standard Grade. In "Heartwood" species, such as Red Oak or Cherry, no sapwood will be seen on the front of the door. In "sapwood" species, such as Hard Maple, no heartwood will be seen on the front of the door. Premium Grade is a good choice for natural and light-colored stain finishes. Standard Grade is for a wide variety of applications and will provide a good, versatile product at a good price. Standard grade material allows for many of the natural characteristics of the wood to be present in the doors and drawer fronts while eliminating the most objectionable characteristics. Character marks such as pin knots and mineral streaks are limited in size. In "Heartwood" species, such as Red Oak or Cherry, the amount of sapwood that is present on the face of the dor or drawer front is limited and will only be present in the profiled areas. In "sapwood" species, such as Hard Maple, the heartwood will be limited to the profiled areas. Standard Grade works well with most finishes. Light-tinted and clear finishes may accentuate the natural characteristics and color differences within the product. Paint Grade Maple allows the for the entire color range of the wood, including stains and mineral streaks. Knots, wormholes and other defects that would cause voids are limited, providing a smooth, paintable finish. Paint Grade Maple Hybrid uses Paint Grade Maple for the four pieces that make up the frame of the door, but uses MDF for the center panel. Once painted, the MDF surface will match the wood surface. (If painting yourself, talk to your paint provider about the best way to prime or seal the MDF and wood.) MDF is heavier than wood, but it is less likely to expand and contract with changes in humidity. This reduces the risk of gaps or paint cracking where the panel meets the frame, especially in environments where there are large swings in humidity. Rustic Knotty Grade allows knots, split knots, ingrown bark, character marks, and other natural characteristics. The knots are of varying size, both sound and unsound. This grade allows the natural color of the specie, wormholes, and any other naturally occurring defects that may be present in the wood. The amount of such characteristics will vary from piece to piece. Voids will not be puttied. Color variation within a door is minimal. Only minimal number of small, tight knots is allowed. Staves within a door or multi-piece drawer front will have a more uniform grain match. Selected for mostly uniform red color, though tones and grain pattern can vary. Small amount of pitch pockets and very tight knots are allowed. Less than two percent sapwood allowed. Selected for mostly uniform red color with less variation in tones and grain pattern than standard grade. Staves within a door or multi-piece drawer front will have a more uniform grain match. Very small pitch pockets and pin knots allowed, but kept to a minimum. No sapwood allowed on the face. Wide color variation will occur, from dark brown to white. Color may vary within a door and within a set of doors. Some mineral is acceptable. Will have a reasonably uniform light color, though some color variation is allowed. Minimal heartwood will appear on face. Very small mineral streaks allowed and minimal birds-eye type knots are allowed. Mostly tan color tones, though some variation will occur. Variations of grain pattern are expected, though extreme variations not allowed. Minimal amount of mineral allowed. Extreme color variation may occur with sapwood and heartwood intermixed. Mineral streaks and other natural defects are allowed, but material will be sound. Selected for minimal color and grain pattern variation. Only a small amount of mineral allowed. Medium-density fibreboard (MDF) is an engineered wood product made by breaking down hardwood or softwood residuals into wood fibres, often in a defibrator, combining it with wax and a resin binder, and forming panels by applying high temperature and pressure. MDF is generally denser than plywood. MDF is suitable for painting, but not for staining. Species not listed here, including Ash, Beech, Sapele and Walnut, will adhere to generally accepted industry standards for each particular wood type and grade. Rustic knotty Alder, Rustic knotty Cherry, Rustic Knotty Hickory, Rustic Knotty Maple and Rustic Knotty Red Oak are available. The Rustic Knotty grade allows for unlimited size knots and splits as long as any void is under 3/16�. About Horizon Cabinet Door Co. Horizon Cabinet Door Co. is a joint initiative between one of the country's leading cabinetry companies and a top online cabinet sales organization. We came together to provide contractors, refacers and do-it-yourselfers a self-service site for purchasing high-quality doors, drawers and other refacing materials at low prices.